Ready to feast on the world's first fake salmon? Hungry to savor the "first genetically modified animal approved for widespread commercial production and human food," in the words of Dr. Anne Kapuscinski, Dartmouth College Professor of Environmental Studies? If YES, then 2012 might be your lucky gastronomic year, as the U.S. Food & Drug Administration is quite anxious to approve AquaBounty's genetically engineered salmon... dubbed "Frankenfish" by its many critics... and the FDA apparently doesn't give a damn what the public thinks. Briefly, AquaBounty Technologies has engineered a fast-growing Atlantic salmon by "artificially combining growth hormones from an unrelated Pacific salmon with DNA from the anti-freeze genes of an eelpout. "This modification causes production of growth-hormone year-round, creating a fish the company claims grows at twice the normal rate, allowing factory fish farms to crowd fish into pens and still get high production rates," per the Center for Food Safety. The result is a farmed, genetically modified salmon... transgenic salmon... that reaches market in half the time, 18 months rather than three years. The company christened its new creation the AquAdvantage salmon. By academics and scientists specializing in biotechnology, animal genomics, sustainable science, nutrition and health, toxicology, and more. A fascinating NPR discussion between two such academics, from UC Davis and Dartmouth College, can be found at Debating Genetically Modified Salmon. By retailers and wholesalers. As early as 2002, a consortium of 200 grocers, restaurants and seafood distributors in 40 states pledged to never buy or sell genetically engineered fish. The New York Times then reported in Chefs Join Campaign Against Altered Fish, "The boycott is being led by the Center for Food Safety, Clean Water Action and Friends of the Earth... The list of chefs allied with them include high-profile names like Thomas Keller of the French Laundry.. ; Michel Richard of Citronelle... ; and in New York, Mario Batali at Babbo, Jean-Georges Vongerichten of Jean Georges, David Pasternack at Esca and Eric Ripert at Le Bernardin." By proponents of natural and organic foods...of real foods, not fake foods. Writes NaturalNews.com, "The debate continues over whether or not genetically-modified (GM) salmon is safe for human consumption and fit for approval by the FDA, even though virtually all the evidence indicates that the tampered fish is a threat to human health and to the environment." By a bipartisan coalition of the U.S. Congress. 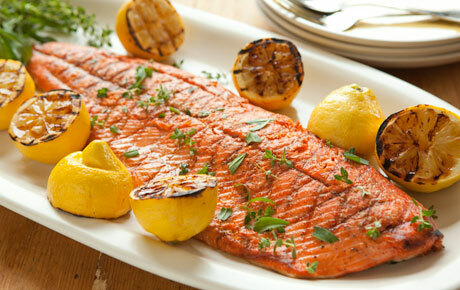 In July 2011, eight U.S. senators penned a letter to the FDA, "asking it to 'immediately cease' consideration of such salmon" and "to abandon its approval process of genetically engineered salmon as food, threatening to push legislation to strip the FDA's funding to study the fish if the agency does not comply," per the Los Angeles Times. House opposition is led by Republican Rep. Don Young who commented, "“Frankenfish is uncertain and unnecessary. 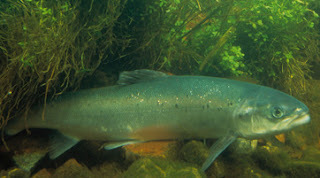 Should it receive approval as an animal drug, it clears the path to introduce it into the food supply... Any approval of genetically modified salmon could seriously threaten wild salmon populations... Frankenfish is bad policy all around." Criticisms of the transgenic AquAdvantage salmon, are quite complex, and center on two main areas: human health, and irreparable damage to wild salmon stocks. In 2011, the National Research Council rated as "low to moderate" the risk to human health from consuming transgenic animals. Chief among concerns is the fact that "AquaBounty has reported that AquAdvantage salmon has 35% higher levels of IGF-1 (a growth hormone) than natural salmon. This is problematic because studies show that there are connections between increased levels of IGF-1 in blood and risk of colon, prostate, and premenopausal breast cancer," per Debatepedia. Another concern is widespread use of antibiotics, a destructive drawback for all farmed and factory-farmed fish and animals. The Center for Food Safety reports, "... the routine use of antibiotics to control diseases often found in farm-raised fish may already be impacting human health. "... the amount of antibiotics given to transgenic fish may be higher than the amount currently given to farmed fish; already farmed salmon are given more antibiotics than any other livestock by weight. By eating farmed fish treated with antibiotics humans will be ingesting antibiotics that may be harmful... Finally, the use of antibiotics in aquaculture also exacerbates the significant problem of antibiotic resistant bacteria." A scary health unknown comes from GaiaHealth.com, "The method used to transfer genes is not being provided to the public. 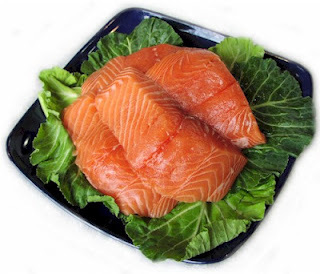 If a virus was used as a vector to transfer the genes, then the potential for inducing cancer in people who eat the salmon exists. The FDA does not seem to believe that we have the right to know what gene-transfer technique is used." The Center for Food Safety adds, "The feed given to farmed salmon often also contains questionable additives and dyes to artificially turn farmed salmon’s grayish flesh more pink and appetizing to consumers." Such feed is presumably also given to transgenic salon. GMO salmon can cause irreparable damage to already faltering wild salmon populations in two primary ways if the rapidly-growing GMO fish escaped into oceans: through contamination via interbreeding, and increased competition for food and mates. For a balanced, well-informed look on the impact of GMO salmon on wild salmon populations, see NPR's Debating Genetically Modified Salmon. So What's a Wild Salmon Supporter to Do? If you're appalled, rather than tantalized, by the prospect of the first genetically modified animal approved for human consumption... by Frankenfish... what can you do to affect this fake food catastrophe? First, contact your U.S senators to express unfettered support for a pending bill to prevent FDA approval of genetically-engineered fish. The Senate bill, S.230, was introduced by Sen. Mark Begich of Alaska on January 31, 2011, and has since been buried in the Senate Health and Education Committee. Second, raise a ruckus with the FDA, which is part of the federal Health & Human Services Department, over this half-baked, shoddily-researched proposal. Raise a noisy ruckus, by lodging complaints through the FDA website. Voice your support for the petition filed on February 7, 2012 with the FDA by the Food & Water Watch, Consumers Union, and the Center for Food Safety, to ban genetically engineered salmon as unsafe. Third, be frightened over aggressive pushing by AquaBounty Technologies that GMO salmon not be labeled, so that buyers can't differentiate between wild, farmed, and genetically modified salmon. Be frightened enough to insist that retailers provide full info about the salmon they sell. The Los Angeles Times reports that AquaBounty's president would "have no problem with a voluntary label affixed by salmon producers, but fears a mandatory label would look like a warning. In the past, the FDA has taken the position that required labeling should contain only information on content, not how an item was produced." However, the Center for Food Safety insists, "Should FDA decide to approve the AquAdvantage GE salmon despite our opposition, clear, mandatory labeling is an absolute must to allow consumers to make informed purchasing decisions." Count me in with the latter: If genetically engineered fish, including salmon, is not clearly labeled, I will sadly skip buying and eating salmon altogether. I would skip it as a matter of health, and as a matter of principle. Will join me? ALL GM fish should have a label attached to packaging. I will only buy WILD fish of any kind. All GMO foods should be clearly labeled, I believe. Yes, in our home, too, we only buy wild-caught fish. Hello, I think the same but I have one question: is there already the ge salmon on the market? As a marine biology student, I largely consider this article to be scare-mongering. There has never, in history, been a case of artificial chemicals in fish causing adverse effects on human health, so why should that change now? Growth hormones and antifreeze proteins have been used for YEARS.